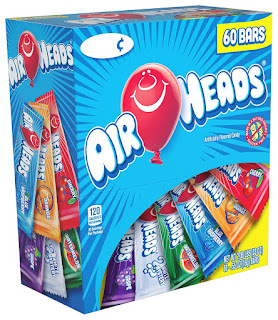 Hop on over to Amazon.com where they are offering 15% off your first subscription of select Airheads products. Even sweeter, many of these items give you the option to Subscribe and Save – which means you'll save even more and score free shipping. As one deal idea, you can score this 60-pack of Airhead Bars Variety Pack for only $6.38 shipped when you clip the 15% off coupon and opt to Subscribe and Save – just 11¢ per bar! These bars have no "Big 8" allergens (no milk, eggs, peanuts, tree nuts, soy, fish, shellfish, wheat) – great for handing out on Halloween!